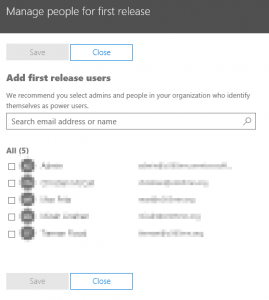 First release is a selective program that any administrator can enroll in to try out new Office 365 features before they roll out to everyone else. This is a part of all Microsoft’s Office 365 plans (with the exception of consumer plans). The features that you receive will be fully functional as they are tested by Microsoft internally before they reach your doorstep. Features are always tested internally by Microsoft. 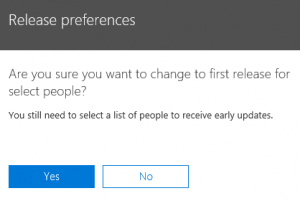 After the testing by Microsoft, the features are rolled out to First Release customers who try out the features in the wild to ensure they work as expected. If there are any significant issues, the features are rolled back. If everything works as expected, the features then roll out to Office 365 customers worldwide. Option 1: Enable it for your entire tenant in Office 365. This means that every user in your Office 365 organization will experience the new features before they are released worldwide. This may sound tempting, but the second option is a much smarter bet. Option 2: Enable it for select users in your tenant. This means that only the users you select will experience the new features before everyone else. Why & How to use it? 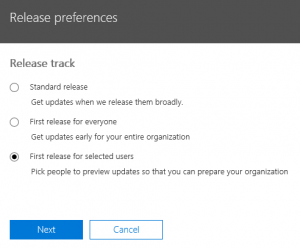 Why should you enable First Release, and why only for select users? 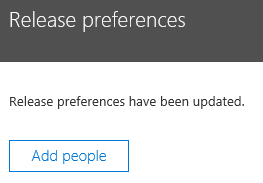 Because First Release is Microsoft’s way of providing you with a lightweight change management platform. Any time a new feature is introduced in a software package, two factors need to be considered. The first factor is “is it functional?”. If the feature doesn’t work, then it should be held back. In Office 365, this is taken care of by Microsoft in rings 0-2 above. The second factor is “how will this be used?”. If it’s unclear how the feature will be used in the organization, then why would anyone use it? In Office 365, this is your responsibility. As many IT employees as possible. They are the ones who tend to notice glitches. At least one employee from each business unit. Each business unit tends to work differently, so features will impact them in different ways. Employees who are able to handle change well and will provide you with useful feedback. 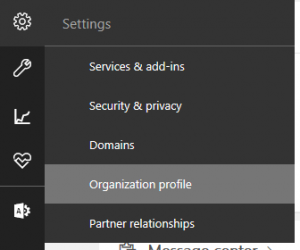 Need additional assistance with First Release or Office 365? Get in touch with me on Twitter (@TheCloudSherpa) or at sales@nowmicro.com. Previous PostPrevious Will It Play 4K?